So, I’ve survived my first Uni ski trip! More than survived really, I absolutely loved it. 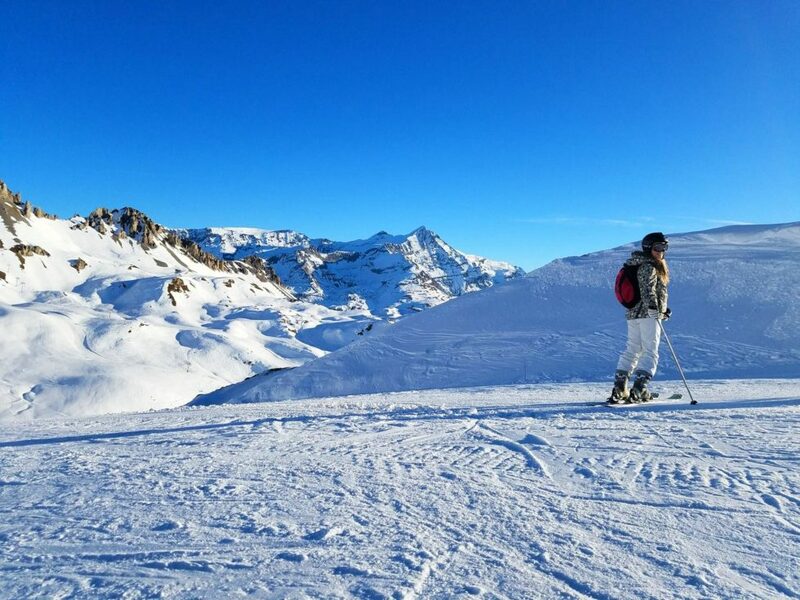 From the first time my mum told me the outrageous stories from her own ski trip, the experience has been very close to the top of my uni bucket list… a right of passage in a weird kind of way. I actually beat my fresher-self as well. As I mentioned in my Fresher’s week post all that time ago, I had to take night 3 off… weak. 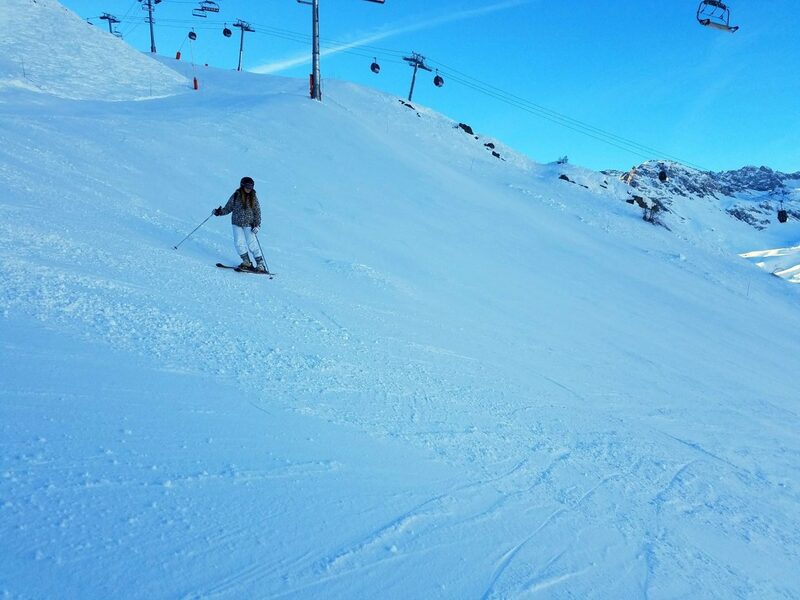 I succeeded in going out every night and skiing every day on the ski trip and I’m somewhat proud really! 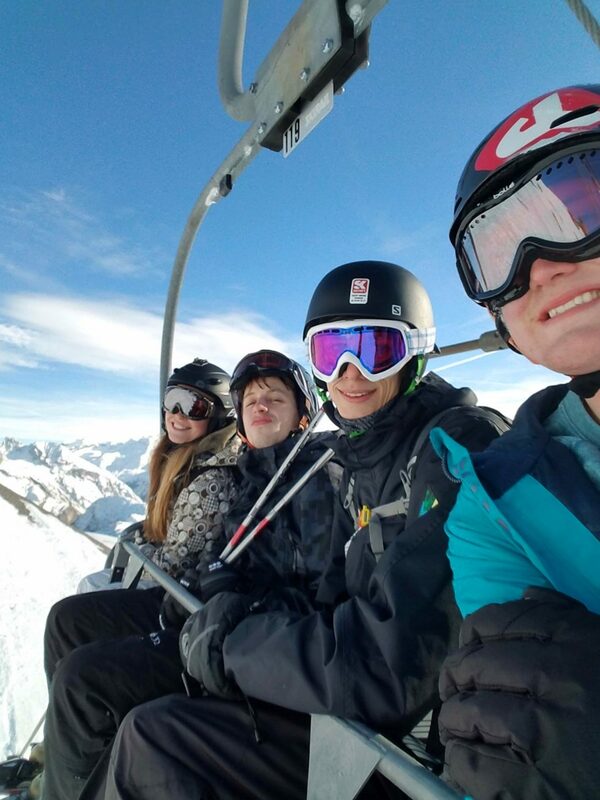 Anyway, first year just didn’t feel like a financially appropriate time to go on the ski trip, nor (to be bluntly honest) did I really have enough friends yet. This year however, I fully intended on following my mum’s own brilliantly disgraceful footsteps and throw myself into the crazy experience, and thank goodness I did- I’ll do the whole again next year! 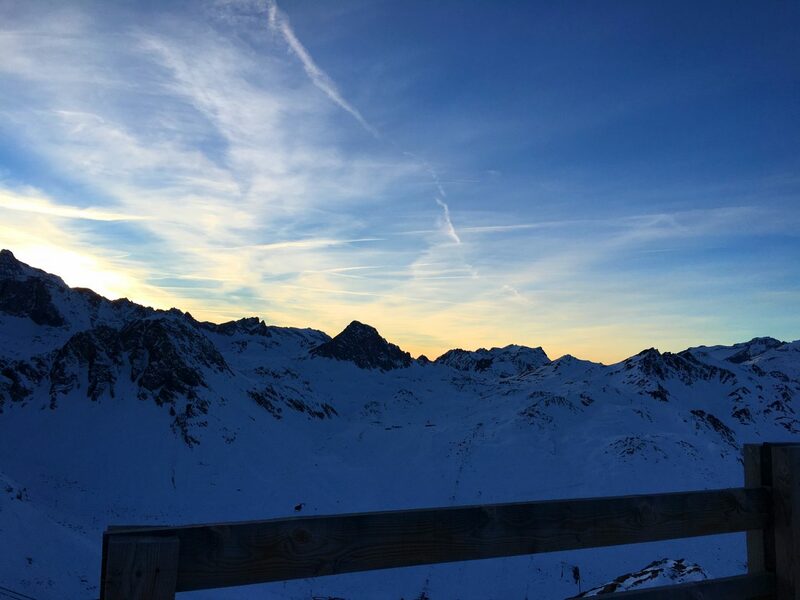 In truth, freshers were in a minority so really I think I played my timing right, and it’s advice I’d give to anybody thinking about going on a uni ski trip: definitely do it… but wait until you have a bit more social standing as a second year, at least! I had a few friends also signed up to the trip (which sold out in 5 mins!!! Talk about the stress of getting Beyoncé tickets, this was something else! But pays tribute to the popularity of such a holiday). Unfortunately, I didn’t end up in a room with any of them and suddenly I was faced with the rather daunting prospect of an 8-bed dormitory of people I had never met but who (on Facebook stalking each of them) I realised knew each other already. Generally speaking I’m a hugely sociable person and I love meeting new people, but this caused a great deal of anxiety for me. I would have to sleep, change, ski, cook, potentially even drink and go out with them… and this was quite scary really. In hindsight, however, this situation was a massive blessing. 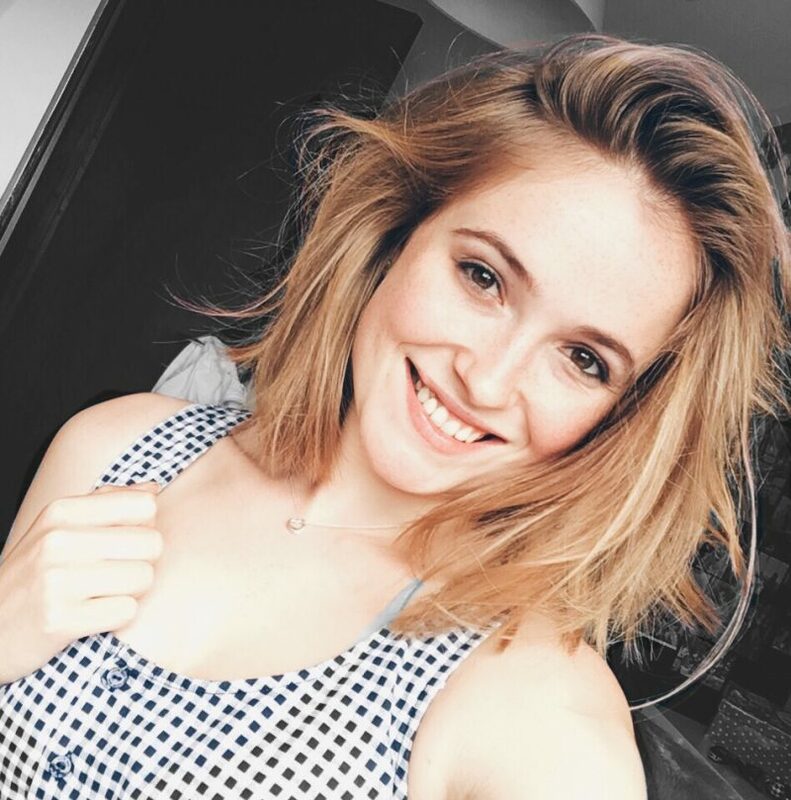 I hit gold with the people I found myself with, they were lovely and so much fun and we really bonded as a group. 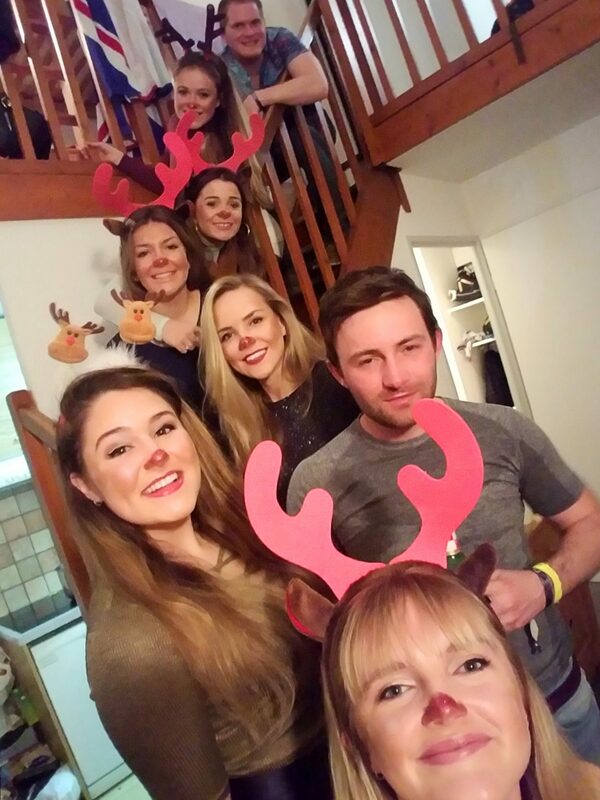 Here they all are, a group of smiley reindeer! Also, with the biggest apartment, we were the host of many a pre-party-party and as a result I’ve come out of the trip with a number of new friends (cringe I’m sorry, but genuinely true). This whole thing harks back to the throwing myself at stuff this year. Advice to all- embrace the unknown, see such experiences as an opportunity to spread yourself as a social butterfly. Actually seek out fresher-type situations where you have no choice but to make friends! Side note as well, the Alps or any snowy mountain for that matter makes for an ideal location for these situations, their sheer size puts any stress into perspective. 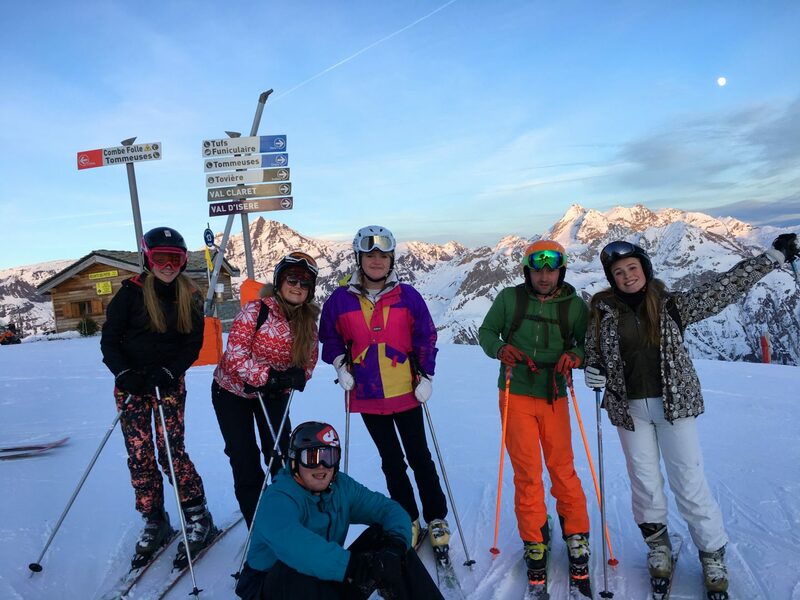 I was fortunate with the group I landed with as well due to their keenness for skiing. 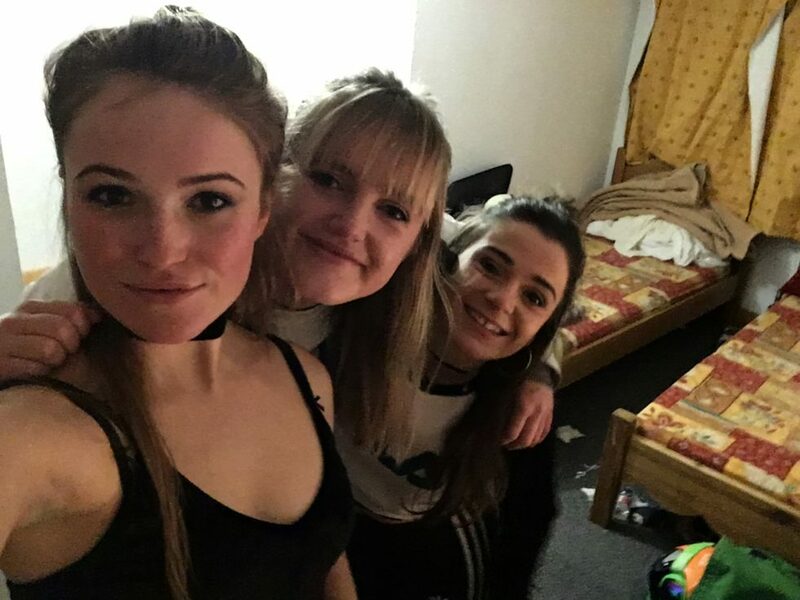 True enough, you do get a few who attend the uni ski trip for the après-ski alone. 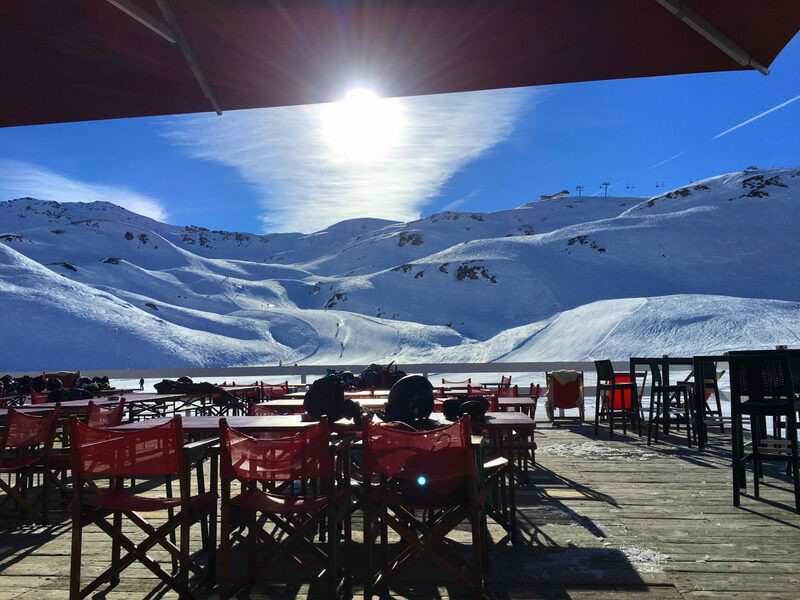 And don’t get me wrong, après is a key part… but the skiing comes first for me really, and was pretty high on the agendas of my roommates too. Near enough every morning we made first lift at 9am, which is impressive when considering our nightly revels in the early hours as well. 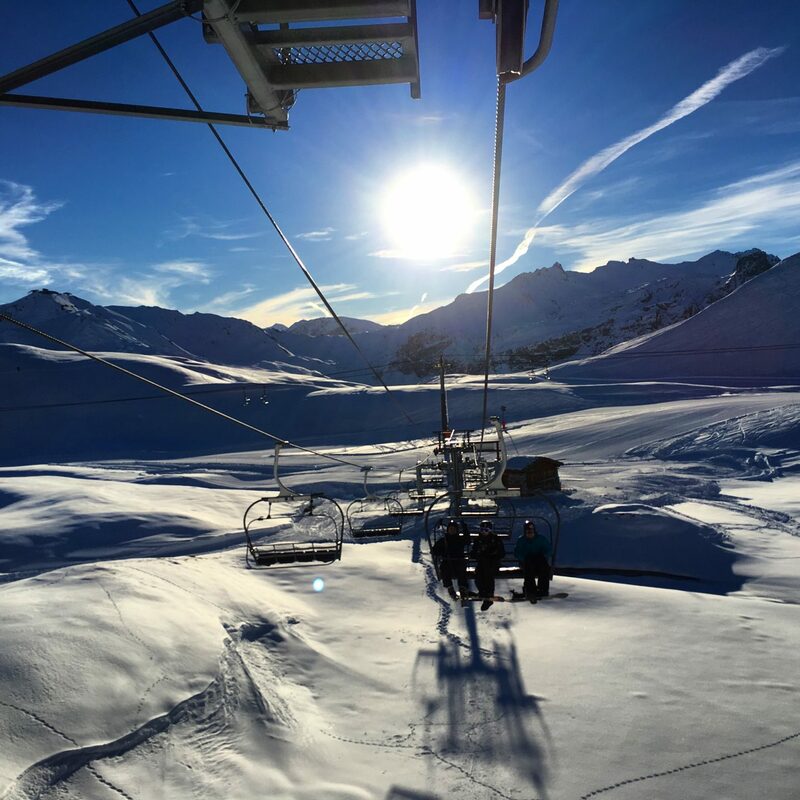 First lift is so so worth it, especially when the weather is as beautifully sunny as it was for us, because the slopes get icy and busy in the afternoon. 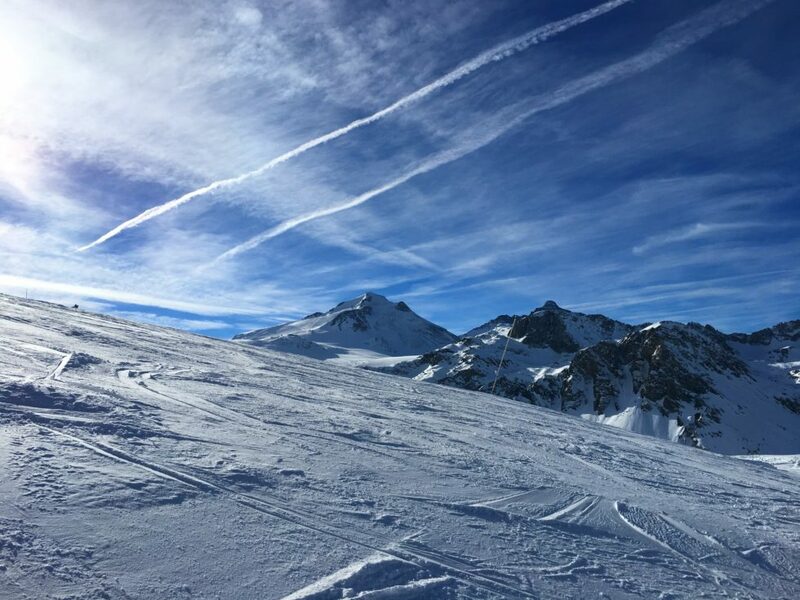 Every day was sunny, and while we agreed we’d happily sacrifice a nice day for a snow storm, it did mean that every ski day was a stunning one. I restrained myself from using my camera as best I could, intent on saving the sights to actual brain memory and just enjoying myself, but of course this willpower didn’t always last… and here I am writing about it after all! 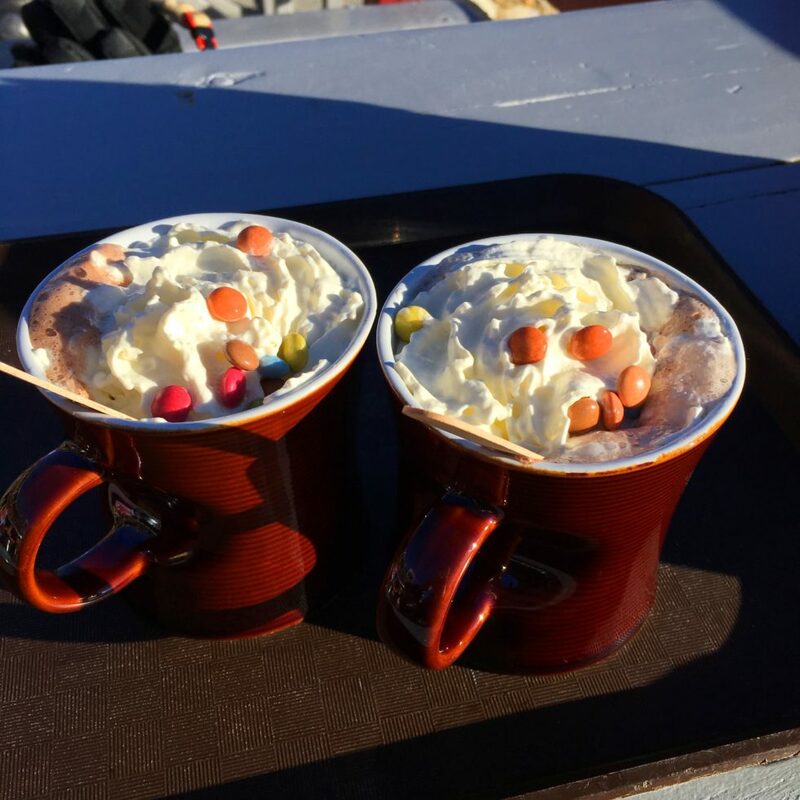 Mountain-side restaurant, L’Alpage… beautiful hot chocolate and hugely over-priced food. But you’re paying for the location really! I’ve got this far and still not mentioned which resort we were in! 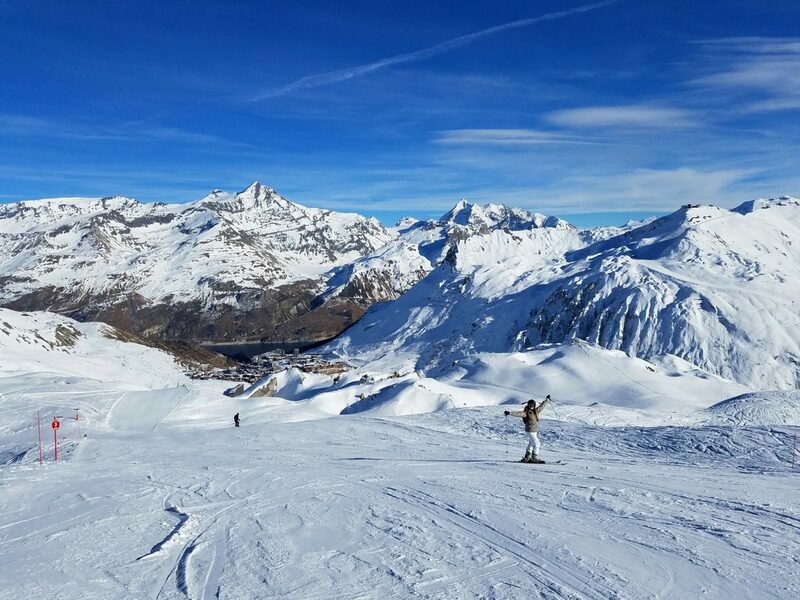 We took the 22+ hour bus journey (I absolutely suggest paying extra for a flying option to anybody considering it; as much as you might try telling yourself the bus journey is all part of the experience, it really isn’t, its not worth it) to the French Alps resort of Tignes. Brumski, the uni ski society, were not the only group there… Nottingham Trent uni and others also joined us, resulting in a resort totally over taken by students. 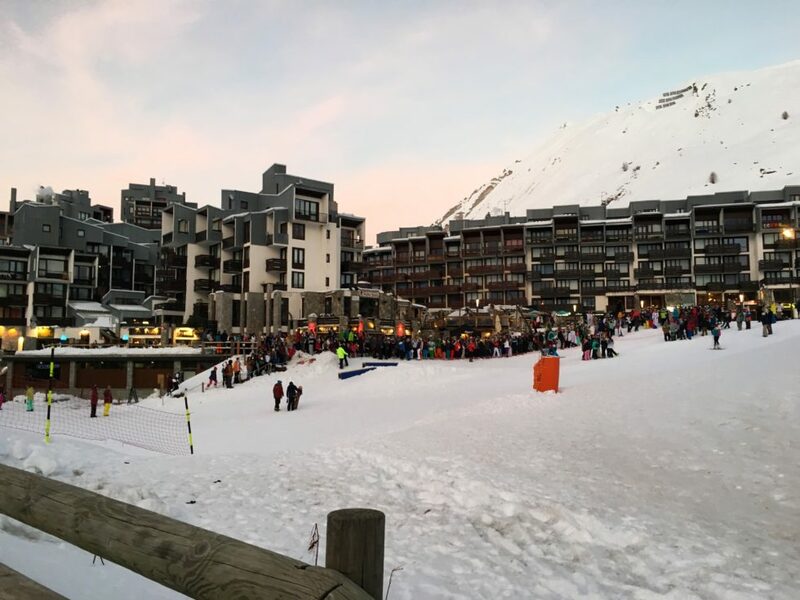 There’s a reason uni ski trips are usually placed outside of school holidays! 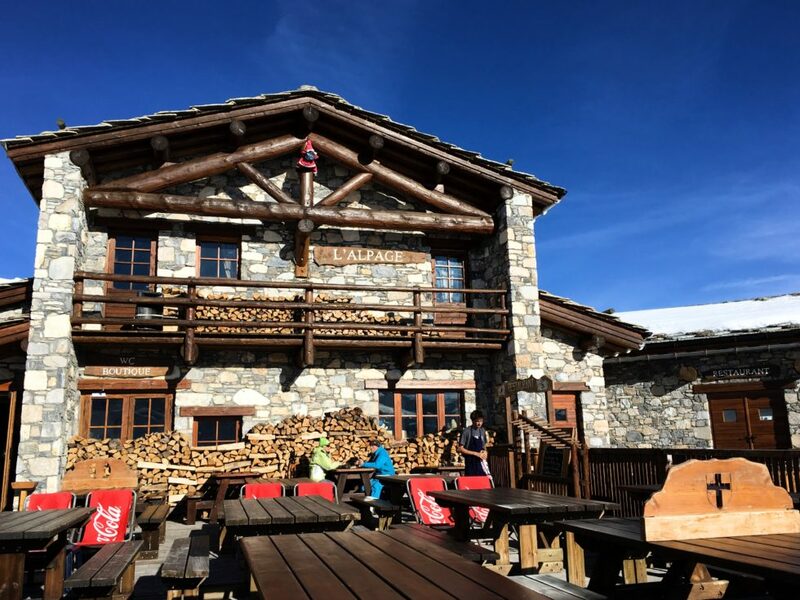 British articles were published on the ‘extreme partying going on in Tignes’- it wasn’t really a family environment for the week we were there. 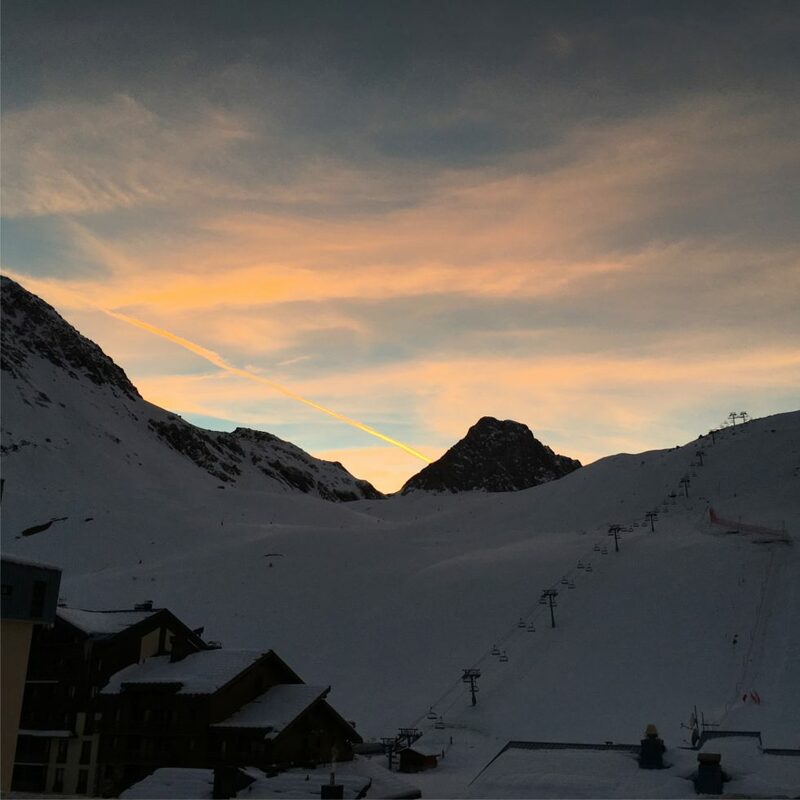 Tignes is a part of the Espace Killy region, of which our lift passes covered the whole thing. 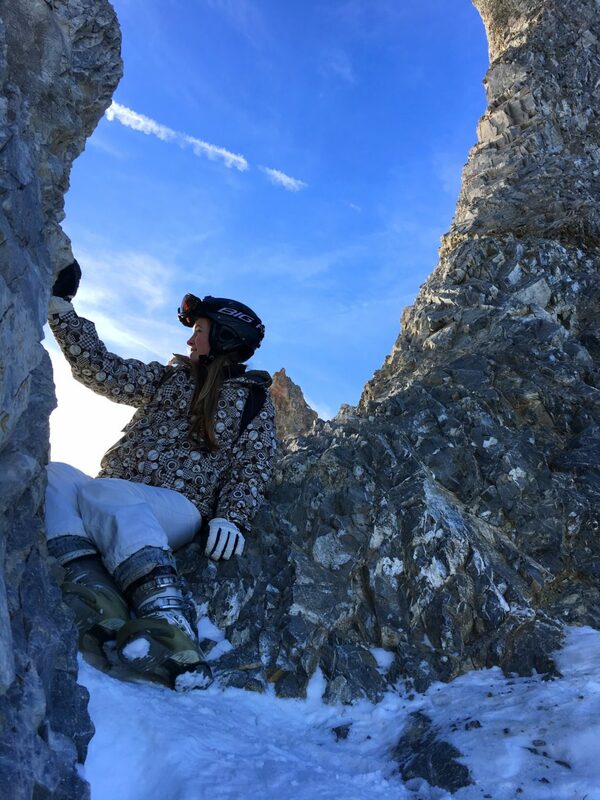 We made it our goal to cover as much of the region as possible, which is actually fairly easy thanks to a comprehensive network of lifts and slopes. 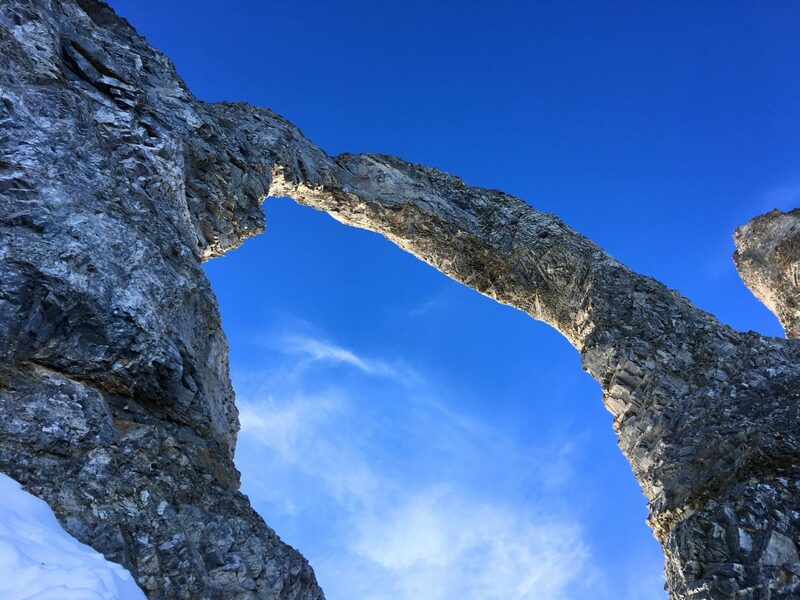 For the first few days we explored the area in the direction of the Aiguille Percée, even climbing up to it on one occasion. I may look serene and composed, but the climb honestly took it out of me… I’m turning away so you cant see how red my cheeks are! 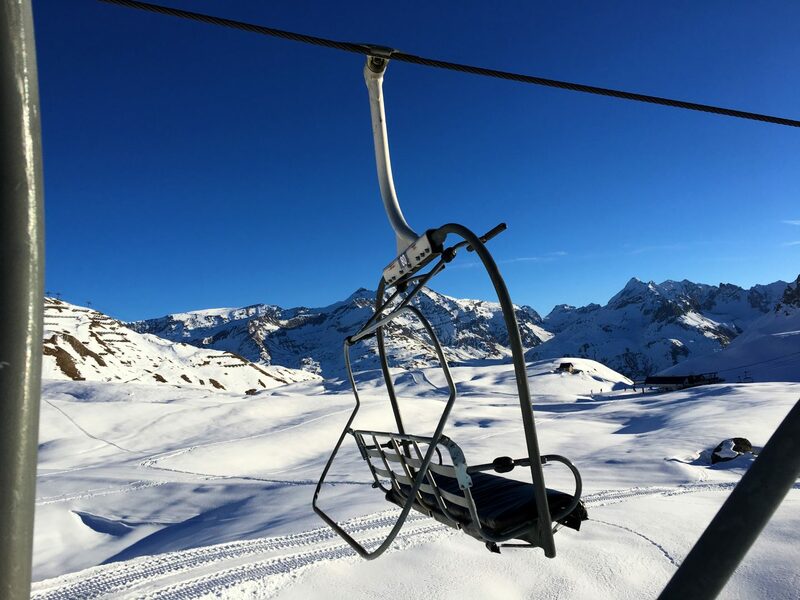 We also skied out towards Val-d’Isère, which was considerably quieter. 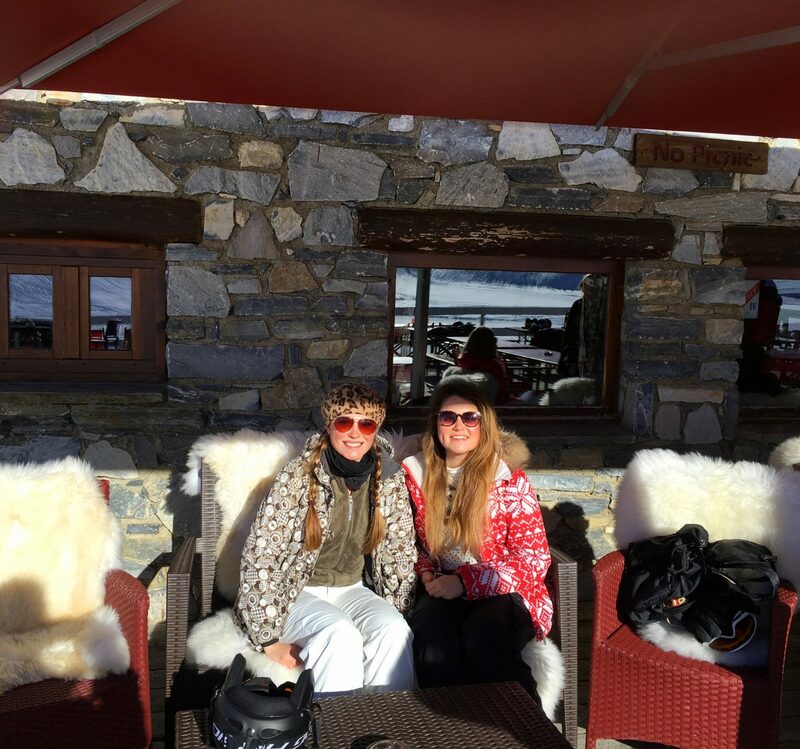 It was here that we came across Tipi bar… a cute little mountain bar/restaurant with fur covered seats in the sun. 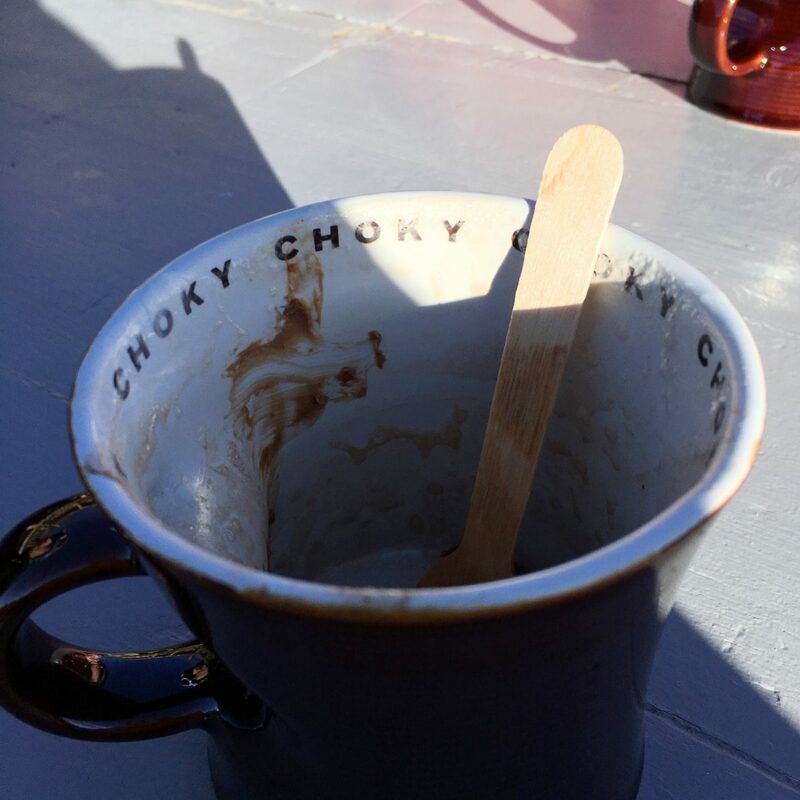 We ordered ourselves a hot chocolate and indulged in the warmth of the sun and freshness of the mountain air.In actual fact, we had our fair share of hot chocolate on this trip- but that just comes with skiing right!? 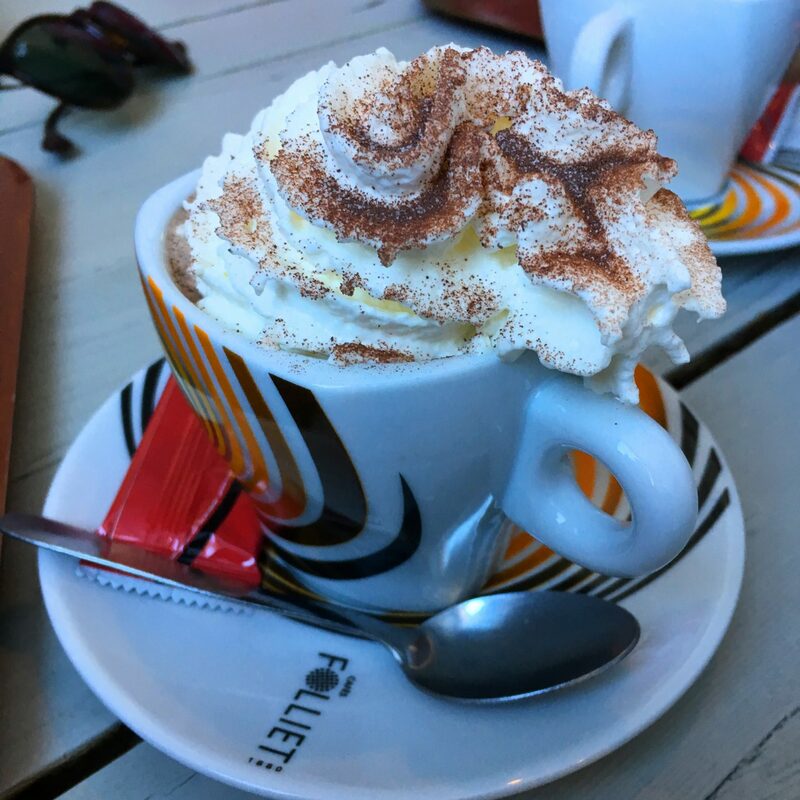 The mountain food was slightly out of my budget so this post is considerably lacking in food photos, so I’ll make up for it with hot-choccy pictures instead! 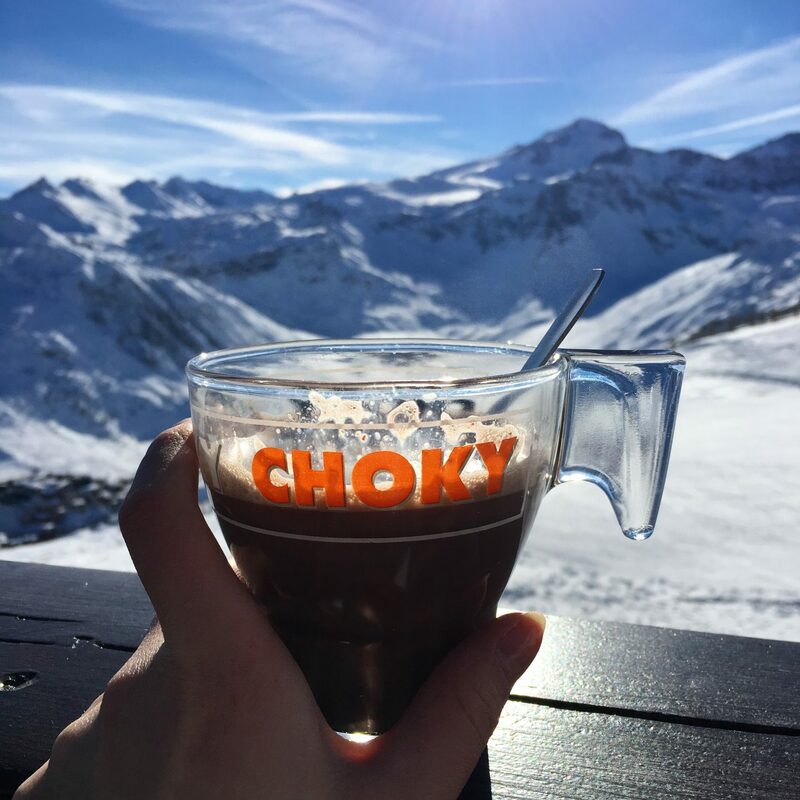 Not much beats hot chocolate with a view. I am still undecided on the level of exercise that skiing might be placed under. I most definitely took it as an excuse to over-carb and eat my body weight, and then some every day. But, I’m actually not all that sure how much of a difference this indulgence actually had… my salopettes stayed the same level of slightly-too-tight from beginning to end, they didn’t loosen, but they also didn’t get tighter! So I briefly mentioned après-ski. This was an occasion of every night, where warm mulled wine flowed and music disrupted the mountain serenity. It was fabulous and warmed us up for the party evenings ahead! I edited my outfit somewhat, instead. 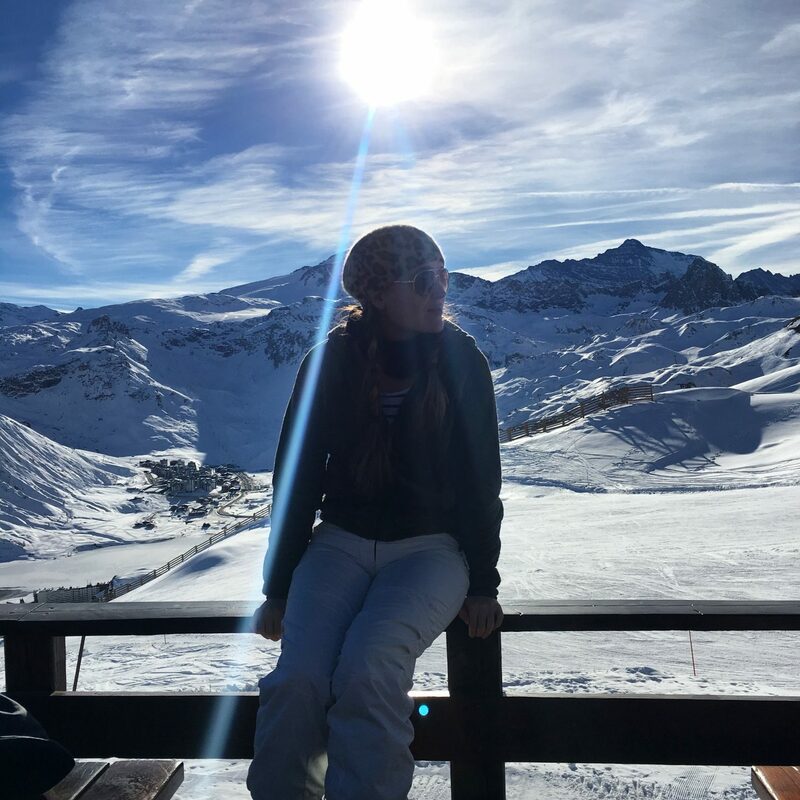 A uni ski trip creates a kind of other world in which sleep doesn’t really exist and in which over-indulgence of food and drink is the norm, as is frolicking around in the snow dressed as Where’s Wally. It’s a world I am still recovering from visiting. And it’s a world I most definitely want to visit again and would 100% recommend every student to visit at some point too. In fact, it needs to be on everybody’s uni bucket list as a necessary life-experience. 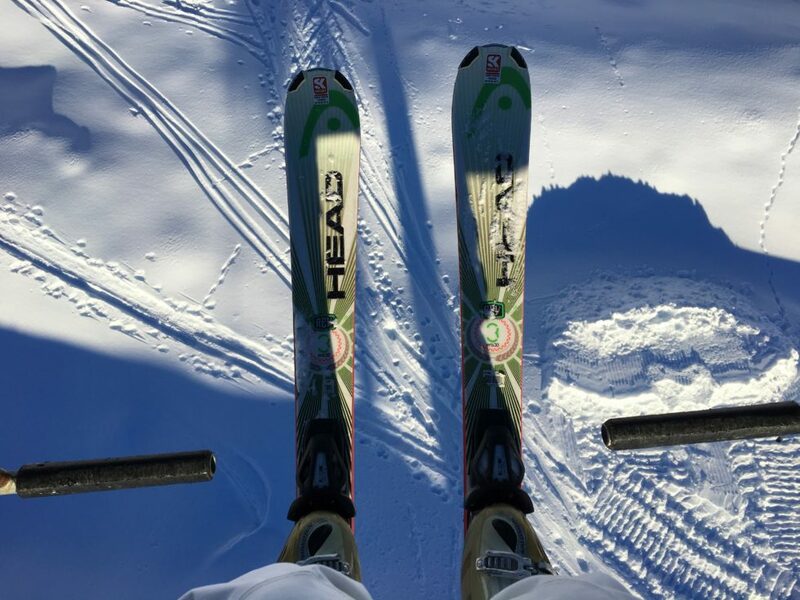 Even if you have never skied in your life, take it as the perfect opportunity to learn and have fun in the same week! Until next time Tignes, you were incredible.